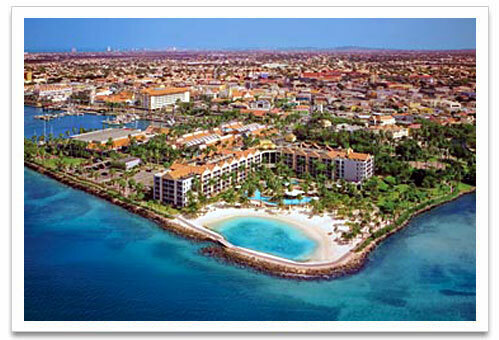 The five-story, 257-suite Renaissance Aruba Resort and Casino Ocean Suites timeshare building is adjacent to the Caribbean Sea. This casual, family-friendly resort features a lagoon-style pool with swim up bar, a freeform pool, an artificial saltwater swimming lagoon with beach, a children's club, Seaport Casino, and the open-air Seaport Marketplace with its 40 shops, 15 restaurants and cafés, and a multiplex movie theater. The Ocean Suites section has its own open-air lobby, a conference center, and an oceanfront path. Shuttle boats to the private island stop for Ocean Suites guests at the marina. These air conditioned one bedroom suites have one king bed, living room with Queen sofa bed, Kitchenette has cook top, refrigerator, microwave and coffee maker. There is a limit of four people per suite.